Set a target of 332 to win, Bangladesh saw the return of Tamim Iqbal, who wasted no time nor showed any signs of being away from the sport due to injury. He punished the WINDIES fast bowlers smashing 13-fours and 4-sixes in his way to an unbeaten 107. Opening partner Imrul Kayes was the first wicket to fall, he made 27. 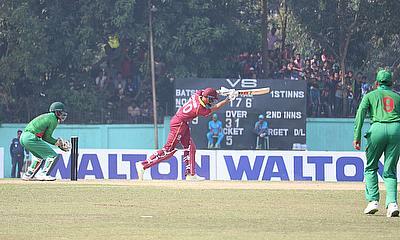 Tamim batted with Mohammad Mithun and the pair posted 114 together, with Tamim the run-scorer.